and now, without further ado, this a.maz.ing. salad! you’ve got to try it. seriously. my sister made this salad and brought it to a get together we had at my house last summer. she called it “yummy salad” and it’s no wonder – the first time i tried it i was hooked! it truly is the yummiest salad i had ever tasted! i couldn’t get it out of my head (get the taste out of my mouth?!) and i craved it for months thinking that it would take time and effort to make…i mean, it’s looked incredible + she made her own dressing and everything. then finally i decided that i couldn’t take it any longer, i just had to try making it myself. and you know what i discovered? it is the easiest salad i had ever made and took no time at all to put together! so in the past few months i have made it on several (yes, several) occasions and it has been devoured each and every time. 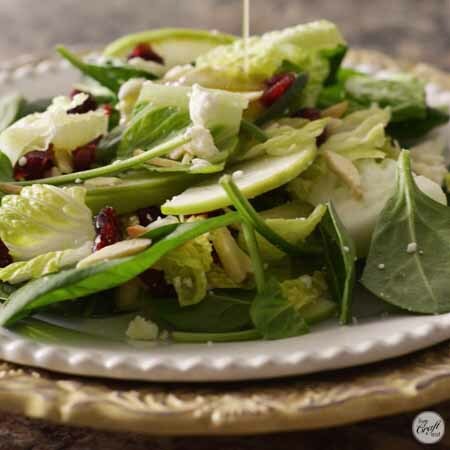 and seriously, the ingredients are so basic and easy to find…it’s just spinach, romaine, dried cranberries (craisins), slivered almonds, a granny smith apple, and feta cheese. and then the dressing ingredients which are just as simple: olive oil, vinegar, sugar, and a packet of dry zesty italian dressing. 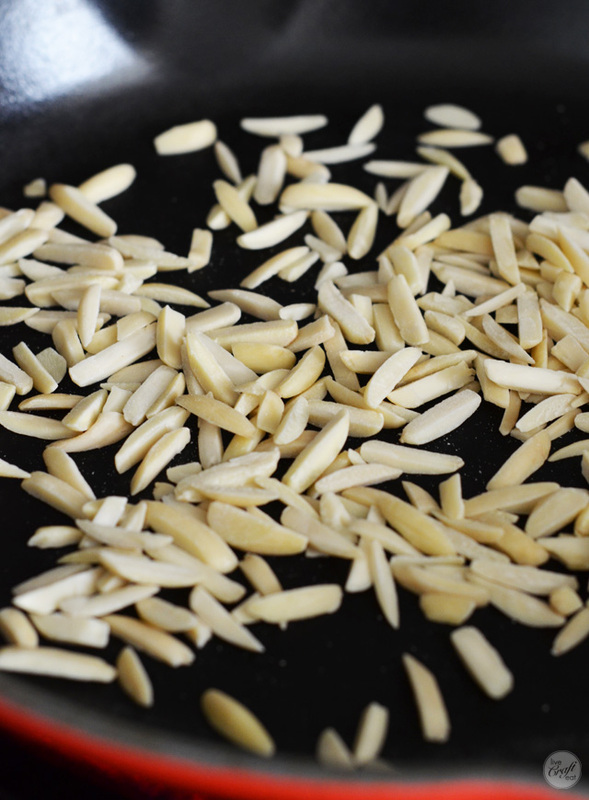 to put it together, you need to toast the almonds, just for a minute or so on medium heat in a dry skillet – when you start to smell them, you’ll know they’re ready! 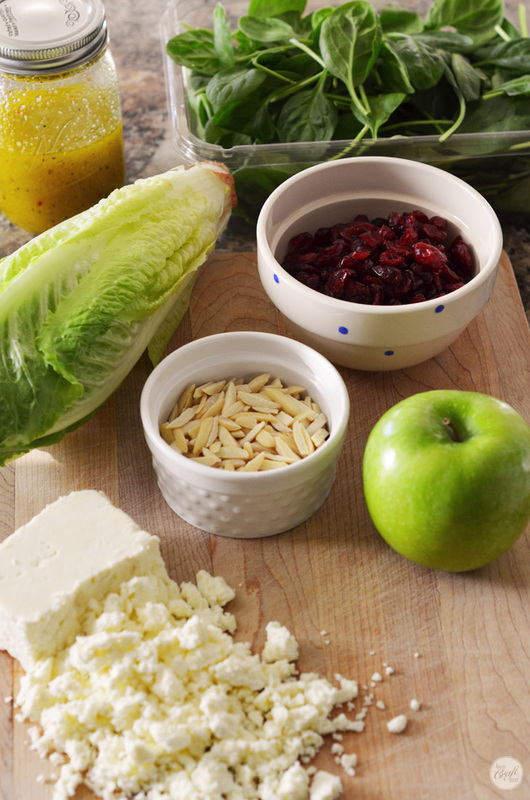 then simply core and thinly slice the granny smith apple, wash + dry the spinach, wash + dry + chop the romaine lettuce into bite size pieces, and crumble the feta. you can add as much or as little of any of these ingredients as you like! but i do what’s pictured above – using only half the block of feta, about 1/2 cup of slivered almonds, and 1/2 cup of the dried cranberries. …and then toss it all together! because this doesn’t keep very well once the dressing has been added, you may want to think about letting everyone drizzle their own dressing on their own salad plates. but be prepared for everyone to drizzle a lot. if they’re anything like me. i loooove dressing and this stuff is amazing! and look how pretty! 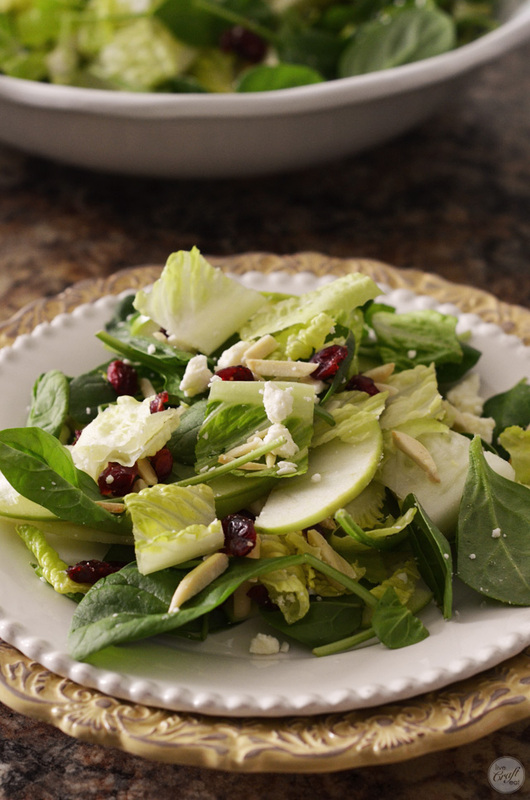 this salad is a yummy addition to any get together. (but i must say that it is especially festive around the holidays with all the red, white, and green!) 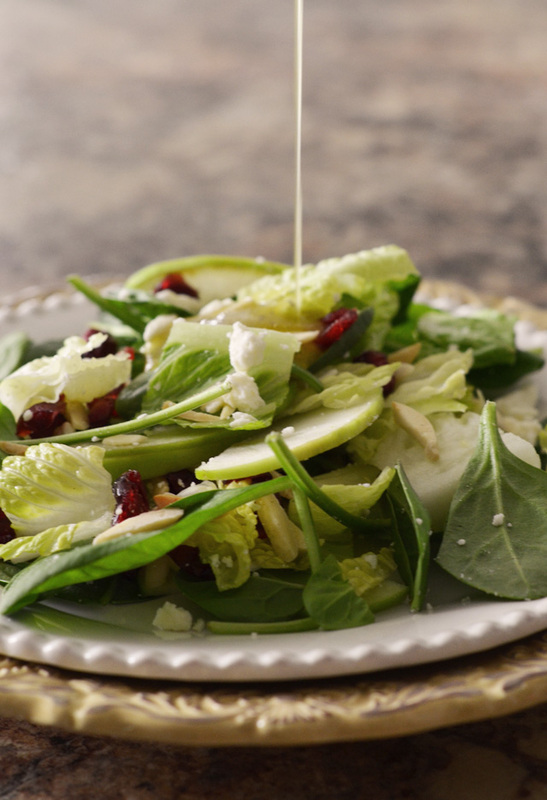 whenever time of year you decide to try this apple cranberry salad, you’ll likely find that you will be making it year round – as often as you possibly can! get the easy peasy recipe below! 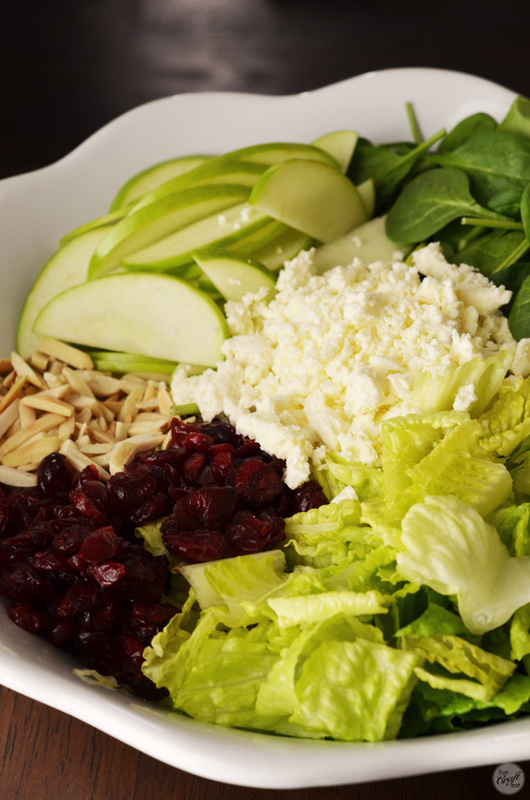 combine all the salad ingredients in a big bowl and serve! add dressing to individual servings (it doesn't keep very well once the dressing has been added). enjoy and repeat. note: add as much or as little of the salad ingredients as you'd like! the recipe shows general amounts that i like using. please also note that the "yield" amount varies depending on how much or little of the ingredients you use. Like the new look of the site! !